Tiny historic seaside town once "a port for wool, whale products and lead ore"
1. Depot - Interpretation Centre - now the Interpretation Centre this Depot was built in 1856. It was 17 m x 9 m and was designed to accommodate 80 men (on a double row of hammocks) who had previously being sleeping under canvas. 2. Officers Quarters - These comprised two dwellings - one occupied by the Officer-in-Charge and the other by a Non-Commissioned Officer. Each measured 5 m x 4 m and was under the same roof with low lean-to areas at the rear. Low stone walls were erected front and back creating private space or garden. 3. Commissariat - was made of stone with a shingled roof and was 8.4 m x 3.6 m.
4. Hospital - was completed in September, 1855. It measured 10 m x 5.5 m and was used for convicts, mine workers, guards, settlers and the families of these people. A medical officer, Joseph Horrocks, was stationed at the depot. Many of the illnesses related to poor diet and a lack of vegetables and fruit. 5. Bake House - it was built in 1855 with the baker's oven forming the core of the building. 6. Lime Kiln - "Erected on sloping ground, the kiln was loaded at the top with limestone. A fire was fed from the base. Lime, derived from burning the rock, provided mortar and limewash for all the buildings and hence it was one of the first structurres built." 7. Lock Up - this was used for short-term imprisonment or for those who were being shipped out to Fremantle. It was 1.2 m x 2.2 m.
8. Well - "constructed of rubble limestone, the well measured 1.3 metres in diameter. It was originally sunk to a depth of 18 metres but the water was brackish and another well was built on the banks of the Hutt River." 9. Magistrate's Quarters - "Following Sanford's resignation as Assistant Superintendent in 1854, the Resident Magistrate for the Victoria District, William Burges, was required to relocate to Lynton where he was temporarily accommodated in the Commissariat until the magistrate's quarters were completed. 10. Blacksmith's Shop - was completed in May 1855 and measured 5.9 m x 4.6 m. There was not always a blacksmith present at the depot and Francis Pearson, a resident of Lynton, was called upon to do blacksmithing duties. 11. Graveyard - the graveyard lies between the Depot and Sanford's Homestead. A single acre was set aside for the graveyard and a church but the church was never built. There were ten or eleven burials in the graveyard including five month old Mary Henshaw, her eleven month old brother James, children of Corporal Henshaw, and Frances Doran, wife of Captain Doran, who died in childbirth. 12. Lynton Barn - in the barn which is now part of the camping facilities below Sanford's Homestead, is a fascinating story about Anna Leonowens, who became governess to the wives and 82 children of the King of Siam, one of the residents of Lynton. 13. Lynton Mill - constructed below Sanford's House this was the flour mill for the entire community. Captain Sanford's Homestead was built by the convicts in 1853 out of limestone. A veranda was subsequently added with masts salvaged from the wreck of the Mary Queen of Scots which ran aground at Archdeacon Ledge in March 1855. 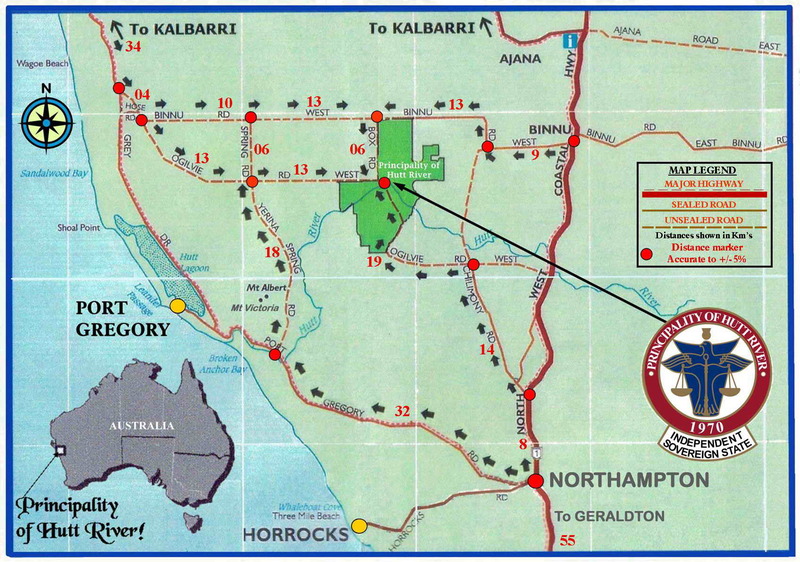 Located north-east of Port Gregory via Yerina Spring Road and Ogilvie Road West (there is a map which can be downloaded at http://www.principality-hutt-river.com/visitors/PHR%20Location%20Map.jpg) is the famous Hutt River Province, the home of Prince Leonard and Princess Shirley of Hutt. This amusing episode in Australian eccentricity resulted when Prince Leonard renamed his wheat farm the Hutt River Province, declared himself a prince and his wife a princess, seceded from Australia and Western Australia and, as a nice little earner, started printing his own stamps. Of course none of his grandiose ambitions had any validity but he did attract an inordinate amount of publicity. They now have a wide range of souvenirs and encourage visits. Check out http://www.principality-hutt-river.com/ for details. * On 22 May 1853 F.T. Gregory and Captain J. Johnson sailed into the Port Gregory harbour with 60 ticket of leave men. The plan was to hire the convicts to local pastoralists. Johnson’s brig Leander ran aground and had to be abandoned.